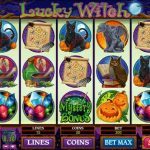 Let’s celebrate Halloween with Lucky Witch video slot game from Microgaming. What is even better here, if you are a fun of eerie music and somehow scary games than you have this game at your disposal all year round. The reels are set in a dark night with full moon. We can see that the graphics are a little outdated since this is an older slot but that does not mean that the game is less appealing. Unique features make this game pass the test of time. 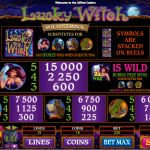 Lucky Witch is packed with special symbols and features. We have 2 wild symbols, the witch which is a wild during the free spins and the game`s logo is wild during the base game. The scatter symbol activates 13 free spins. This feature can be retriggered if you land 3 more scatter symbols and it can also activate the Mystery Bonus. The bubbling cauldron appears on the first, third and the fifth reel and it is the key to the Mystery Bonus. There are 4 different bonus games here which are awarded randomly. In each bonus you need to pick a certain number of items and the great thing here is that you can win up to 30 000 coins. 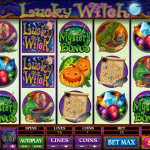 Mix up a potion or two and cast a spell with Lucky Witch video slot game from Microgaming. This game offers a great gaming experience. Thanks to the numerous features like free spins and mini bonus games you forget that you are playing an online slot. It rather looks like a regular game. The good part here is that you can earn some cash while having fun. This may be an old game but that does not mean it should be overlooked. If you’ve always dreamt of going to Nepal then consider first playing Kathmandu a 5 reel slot by MicroGaming.